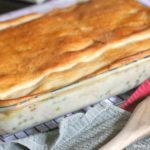 I had to name this post Amazing Chicken Pot Pie Recipe because it is simply one of the best recipes ever. If you have ever tried my Turkey Pot Pie, this is a little knock-off of that version, with just a few changes to make things easier. This is our new winter time favorite recipe, and it is a keeper for sure. Cover with seamless dough sheets and bake! It’s done in less than an hour, and it makes a ton. Perfect for big families or for leftovers. Have you ever tried my Turkey Pot Pie? This is a little knock-off of that version, with just a few changes to make things easier. 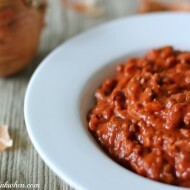 This is our new winter time favorite recipe, and it is a keeper for sure! 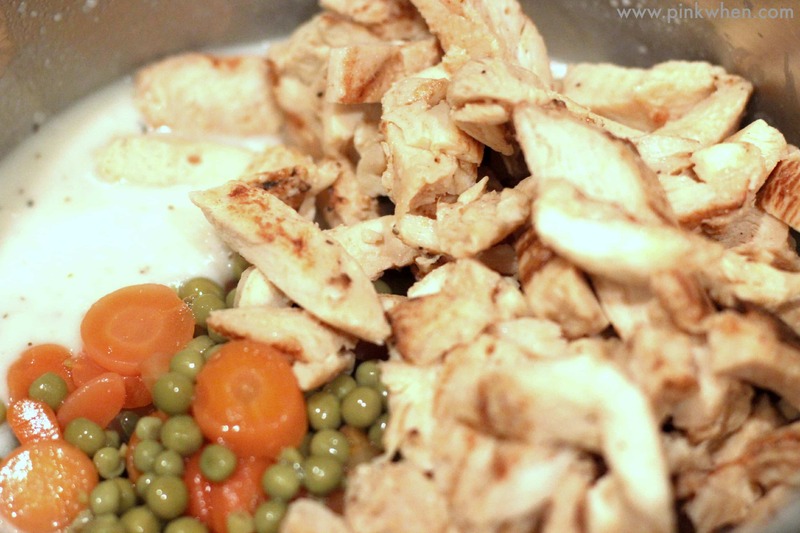 See just how easy it is to make this amazing chicken pot pie recipe. It’s done in less than an hour, and it makes a lot! Perfect for big families or for leftovers. This is a very easy recipe to make, and you only need a few ingredients. Make sure you add these to your shopping list if you don’t have them on hand. 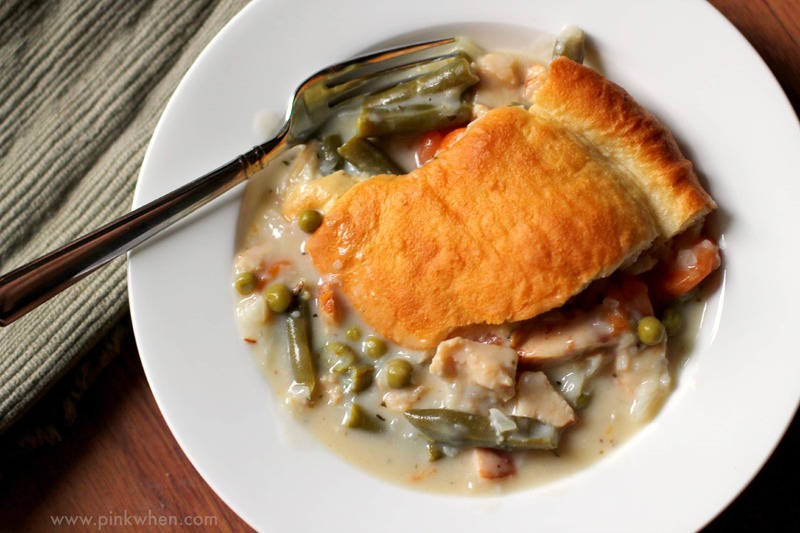 You will need a few ingredients for this amazing one dish Chicken Pot Pie Recipe. How do you make a large batch of chicken pot pie? The secret is actually not to use a pie crust. Instead, you will use dough sheets. You can easily bake this recipe in a 9 x 13 dish and it makes what would amount to 2 pies. Heat oven to 400. In a medium pan, melt butter on medium heat and saute chopped onion. 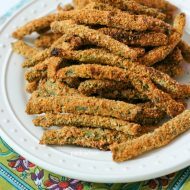 Once onion is sauteed for about 10 minutes, add in the celery seed, onion powder, and Italian seasoning, stirring well. Add 2/3 cup flour to the mixture and stir well, once thickened (about 30 seconds), start whisking in the milk and chicken broth. Continue to whisk until thickened to a consistency of a slightly thick gravy. Add in cooked meat, drained sweet peas and carrots, drained cut green beans, and stir well. 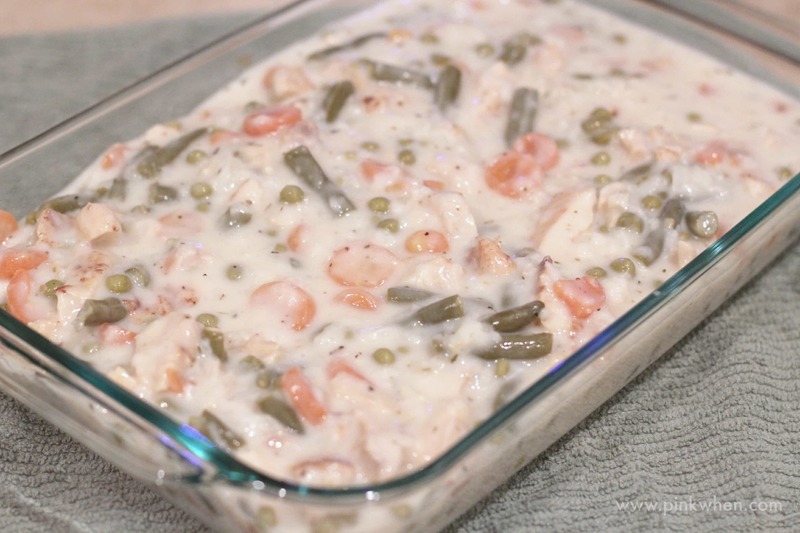 Place Chicken Pot Pie filling mixture into a prepared 9 x 13 glass baking dish. Cover with 2 Pillsbury® Crescent Seamless Dough sheets and then place in oven for 30 minutes. Add a sheet of foil to cover the top of the dish after turning a golden brown (about 10-15 minutes into baking). Continue to bake remaining time. Remove from oven, and allow to cool for 10 minutes before serving. I love this recipe because not only is cleanup made easy with this one dish dinner, but you can make this in under an hour. THAT is also amazing! 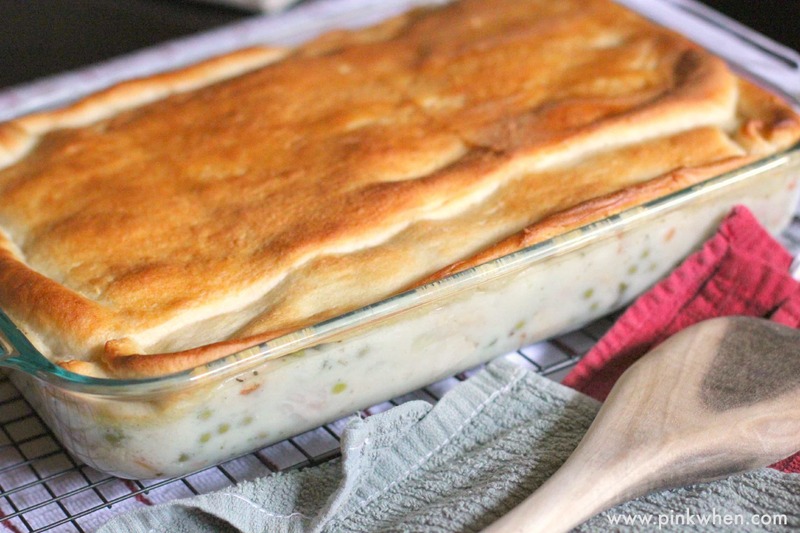 A delicious one dish Chicken Pot Pie Recipe. It's so delicious, and an easy meal to make in under an hour. Cover with 2 Pillsbury® Crescent Seamless Dough sheets and then bake in oven for 30 minutes. Add a sheet of foil to cover top of dish after turning a golden brown (about 10-15 minutes into baking). Continue to bake remaining time. Remove from oven and allow to cool for 10 minutes before serving. Make sure you print out this Amazing Chicken Pot Pie Recipe and save it for your next Winter meal. I am FOREVER trying to find better and better chicken pot pie recipes because I find it to be magical. We’re doing this over the weekend! You will like this one, it is amazing, and EASY! 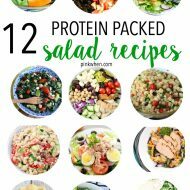 This looks SO delicious – I just pinned to make it this weekend. Thanks for finding those mistakes, apparently I was not doing a great job of proofreading before I posted this. It is corrected!